I wish I could be here more often these days but it’s just not happening right now. We have renovation going on upstairs in our house, side projects, my parents arriving next week, and simply the business of every day life–we are all on the same boat, aren’t we? I cannot wait to be back with stories and pictures, though, so much thanks for your patience. For those of you I will meet this coming Saturday for the book signing, I am really super happy. It will be such a special moment for me. In any case, today, I am still saying hello, with a recipe I wrote a while ago for the Boston Globe. You know how much I love celeriac. The French often do. Do you remember this soup, this salad, and this tart? I even have another new soup recipe in my cookbook: hello celeriac, sweet potato and apple soup with parsley oil and marjoram! I hope you will enjoy them all. 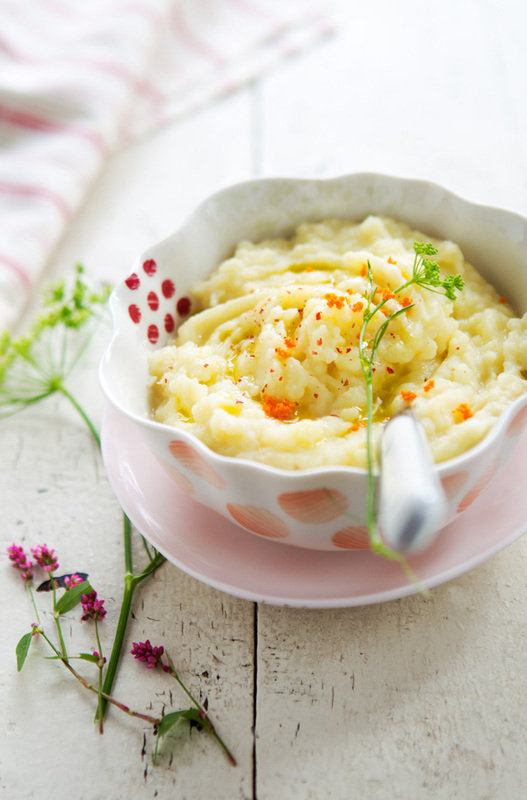 The recipe for Mashed Celeriac and Potato can be found here. This looks intriguing as I’ve never tried celeriac before! What is the orange that you have garnished the mash with? I only read pepper in the ingredient list! So many great ideas for cooking with celeriac! 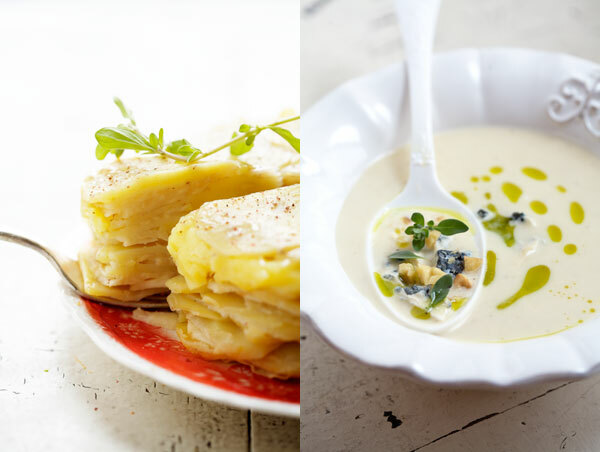 I love the tart and celeriac and apple are a great combination in soup. Thanks for the inspiration. Oh how I love celeriac. It was just yesterday when I made a celeriac purée as a side. It’s much too often that it gets neglected in the kitchen. Such a shame. One thing I’m wondering: do you have any suggestions about how to clean and peel celeriac best? Here, in France, it’s cold and rainy… and these pictures bring me some light and colours! Celery root and marjoram, interesting. I just made a celery root and rutabaga slaw with capers and dried cherries, but now I’m intrigued by your savory herb selection. I’ve never really eaten a lot of celeriac but it looks delicious! It’s a while since I caught up with your lovely posts – it feels like summer all over again. Cela donne envie d’essayer, miam! Sounds really good, but won’t be able to get the recipe unless I subscribe to the Boston Globe and I won’t be doing that anytime soon. You show clear acrylic spoons and glasses in bright colors in your blog , can you tell me where to find them ? I’m in Paris right now . You know… I need to jump on the celeriac bandwagon. It looks magically delicious! Oh how delicious these recipes look. I love all root vegetables and have so many celeriac recipes I want to try. Unfortunately I live in rural upstate New York and cannot find them at any store or market. Oh well, my list will just keep growing with gorgeous recipes like this! Looks like a great recipe, celeriac is such a mystery to me, but always rewarding. I have been enjoying the work of art that is your cookbook so much. It sits next to my couch right now, so that I can peruse it whenever I have the chance. I have cooked a risotto, baked the cranberry cake and the oatmeal cookies, and made one of the soups, too, I think! Everything has turned out wonderfully. Someone commented on how nice it was that the cake is not too sweet, I couldn’t agree more. It is such an obvious labor of love, thank you! i am just getting to know celeriac…so excited to try it this new way! Your food is art. Such beautiful images and creativity. And it motivates me to explore celeriac! Bea! Great site, i love it. I always read you. Im at USA now so im going to try to get your book (im from argentina). Where do you get all your beautifull spoons?? Can I find them here? I first made a similar dish when I received celeriac in a farm share–the farmers also kindly gave us recipe suggestions and something like this was one of them. It was so yummy and quickly because a favorite! It’s been a while since I made it. Thanks for the inspiration–can’t wait to try your version.